The interactions between physicians, nurses, and patients are central to healthcare. Physicians in the United States include both physicians trained by medical education in the United States, and physicians that are international medical graduates who have progressed through the necessary steps to acquire a medical license to practice in a state. Patient’s satisfaction is favored by a good doctor-patient relationship. Nursing is a healthcare profession focused on the care of individuals, families, and communities so they may attain, maintain, or recover optimal health and quality of life. patient’s satisfaction: Patients’ satisfaction with an encounter with health care service is mainly dependent on the duration and efficiency of care, and how empathetic and communicable the health care providers are. doctor-patient relationship: The doctor-patient relationship is central to the practice of healthcare and is essential for the delivery of high-quality health care in the diagnosis and treatment of disease. medical education: Medical education is education related to the practice of being a medical practitioner, either the initial training to become a doctor (i.e., medical school and internship), additional training thereafter (e.g., residency and fellowship), or Physician Assistant education. A physician is a health care provider who practices the profession of medicine, which is concerned with promoting, maintaining or restoring human health through the study, diagnosis, and treatment of disease, injury and other physical and mental impairments. They may focus their practice on certain disease categories, types of patients, or methods of treatment; such physicians are known as specialist medical practitioners. They may also assume responsibility for the provision of continuing comprehensive medical care to individuals, families and communities; these physicians are known as general practitioners. Medical practice properly requires both a detailed knowledge of the academic disciplines (such as anatomy and physiology) underlying diseases and their treatment, and also a decent competence in its applied practice. Physicians in the United States include both physicians trained by medical education in the United States, and physicians that are international medical graduates who have progressed through the necessary steps to acquire a medical license to practice in a state. The U.S. physicians are an important part of the health care in the United States. Currently, the American College of Physicians uses the term physician to describe all medical practitioners holding a professional medical degree. Nursing is a healthcare profession focused on the care of individuals, families, and communities so they may attain, maintain, or recover optimal health and quality of life. There are a number of educational paths to becoming a professional nurse, which vary greatly worldwide, but all involve extensive study of nursing theory and practice, and training in clinical skills. Nursing Science is a field of knowledge based on the contributions of nursing scientists through peer-reviewed scholarly journals and evidenced-based practice. Nurses care for individuals of all ages and cultural backgrounds, who are healthy and ill, in a holistic manner based on the individual’s physical, emotional, psychological, intellectual, social, and spiritual needs. The profession combines physical science, social science, nursing theory, and technology in caring for those individuals. A patient is any recipient of health care services. The patient is most often ill or injured and in need of treatment by a physician, advanced practice registered nurse, or other health care provider. Patients’ satisfaction with an encounter with health care service is mainly dependent on the duration and efficiency of care, and how empathetic and communicable the health care providers are. It is favored by a good doctor-patient relationship. Also, patients that are well informed of the necessary procedures in a clinical encounter, and the time it is expected to take, are generally more satisfied even if there is a longer waiting time. 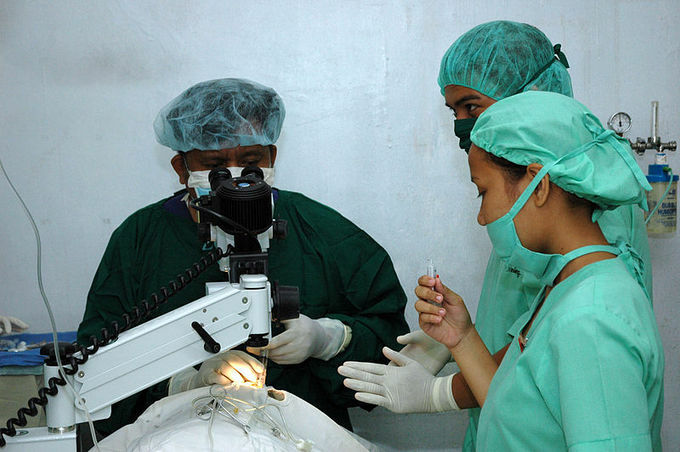 A Doctor Performs a Cataract Surgery: A local doctor performs a cataract surgery on a patient at Zamboanga Medical Center during the U.S. Military Sealift Command (MSC) hospital ship, USNS Mercy (T-AH 19) visit to the city on a scheduled humanitarian visit.